I'd never heard anything by Nonexistence, Philip Santoll's one-man blackened death/doom project, before their newest LP Antarctica, but after listening to it several times, it is rapidly becoming one of my current favorites. With a cold atmospheric sound sometimes similar to that of early November's Doom or Katatonia, but with strong and deep black metal roots to it, it's clearly the work of a multitalented artist who can effortlesly shift extreme-metal genres, though it's hamstrung a bit by the production occasionally. Actually, it's not quite a one-man project anymore, as Black Sun Aeon's Tuomas Saukkonen did the drum and bass sessions this time around. Hope Dies First, a guitar- and piano-driven dirge, is slow and gave me the impression that this would be a doom album, but Santoll's vocals switch from death-metal growls to raspy grating partway through, and it is immediately followed by Vast Abysses Inside, a truly epic piece of doomy, deeply atmospheric metal. The keyboard at the beginning made me think of a Summoning track (which, for me at least, is a very effective invitation to listen further), and the sound is very dark, but it slows down in sections to sound more like doom, with spooky but beautiful minor-key piano passages thrown in. The sound was a bit rough on my promo copy, but a quick visit to Bandcamp later, I can assure you that it's a lot better on the downloaded version. Most of the songs are sung similarly -- growls and raspy shrieks --, though a few have clean vocals protruding dimly through the background at times for effect. Not one song is boring, and even the programmed keyboard effects are done tastefully, such as on Multiverse -- is it doom? Black metal? It doesn't matter -- it sounds great, and whenever a guitar portion starts sounding like it's been playing a while, Santoll pulls out his keyboard and plays a lovely arpeggiated piano riddle, then right back to the blastbeats, harsh growls, and double-kick drumming. The lead guitar is not used for solos, but only for simple melodies that enhance the atmosphere, although it does get a bit more complex in Here is Nowhere, with its high-pitched harmonic screams, and Starless Aeons, which has some synth lead keyboard parts on there as well. Saukkonen's bass didn't stand out to me in the mix, but the drumming is crisply mixed and gives a great underlying beat to the hugely cosmic grandeur Nonexistence attempts to convey in their songs. 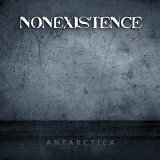 Antarctica is an easy album to under-appreciate without listening to it carefully, but it really is beautifully done and has a lot of variety in the tracks, though all songs have a similar sonic theme of dark, cold loneliness. Santoll has a great talent for building a varied black metal sound with an immersive atmosphere, and I highly recommend the latest fruits of his labors.